Sophsterlicious • UK Blog: . . Glitzy Nailene Glitter FX. . . Glitzy Nailene Glitter FX. 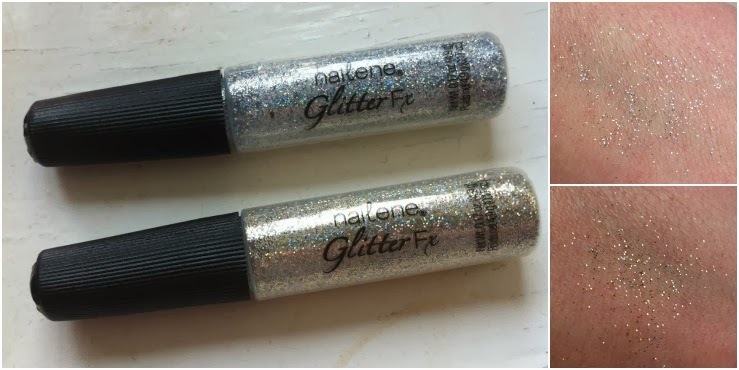 Today I want to talk to you about these cool glitter puffers from Nailene, they are a perfect way of adding some holo glitter to your nails without having to apply layer upon layer of glitter polish. I have the silver and the gold and although the pictures I took of swatches are not that great, these really are super sparkly and pretty with holographic particles that really catch the light. The puffer bottle is designed so that you can just puff the glitter out onto your nails.. I have a problem with this, I find the packaging is flawed and the puffer doesn't really perform that well, so I'm hoping to depot them soon so that I can sprinkle it onto the tips myself and control the amount. I find that the puffer just blows glitter around without it actually going where I want. Another use I love them for is makeup! These make beautiful glitter liner or top coat over an eyeshadow, the glitter is so fine that it doesn't scratch the lid and the multi-coloured particles really sparkle in the light. I don't know if they are actually eye safe, so do this at your own risk.. I never had any problems with it. So, they're pretty and the glitter is so, so pretty and full of sparkle, I just need some empty jars so that I can empty them out and use them a bit easier. Available online. They're a great price too. Kimmy Case iPhone Case Review. Remington Smooth and Silky Epilator. Oriflame - Skin Dream BB Cream. The Fragrance Shop - Discovery Club Box!